Thank goodness for friend’s birthdays to pull you away from your busyness and let you sit down, relax and enjoy good food! Life is going in so many directions at the moment, keeping me away from here and doing other things I love. On the flip side, I am working on so many exciting projects with our wine, our vineyard and our AVA (American Viticultural Area) I can’t help feel a little giddy about it! However, yesterday, at a little impromtu birthday crab feast, I had to throw in my two sense with these nachos. Man, they were good. The kind of good where you think about them before you make them (mouth-watering) and then wish you were eating them for breakfast the next day. 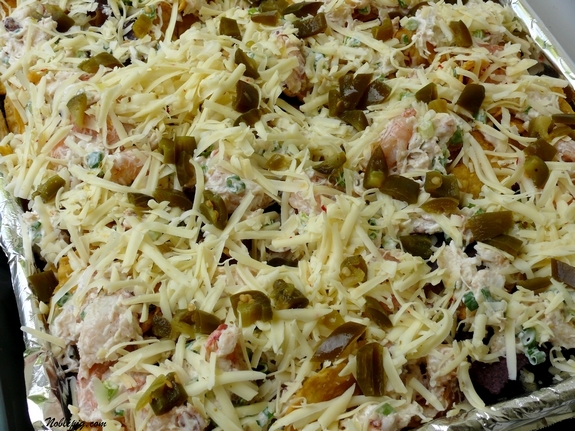 Adding shrimp and crabmeat to the classic mixture of tortilla chips, melted cheese and pickled jalapenos made these stand out as the perfect pre-dinner appetizer….well, this could have been dinner, but why stop there. And we didn’t. Heat oil in a large nonstick skillet over medium heat. Add shrimp, cumin and garlic; saute 3 minutes or until shrimp are pink. 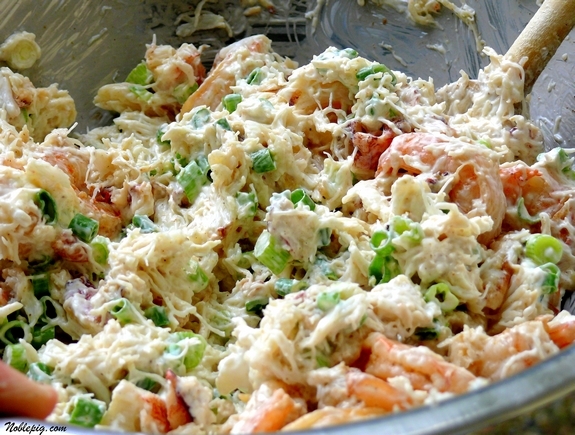 Combine cooked shrimp, crab, sour cream and green onions in a large bowl. Spread tortilla chips on an aluminum foil-lined baking sheet. Top with shrimp mixture. Sprinkle with cheese and top with jalapeno. Broil 5 to 6 inches from heat 2-3 minutes or until cheese melts. Serve immediately. Now that is the way to make nachos!!! Question: What size shrimp did you use? I used large…they shrunk up nicely to bite-sized pieces after cooking. Sounds soooo yummy~ glad you’re enjoying yourself with all the work and wine!! 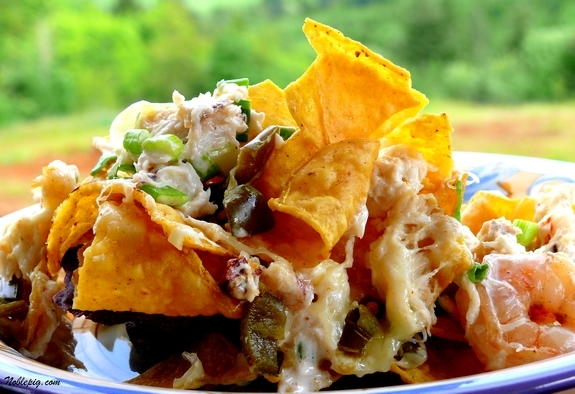 Topping one of my favorites foods, nachos, with my favorite seafood sounds like a very, very good idea! seafood and nachos.. i want this so badly! What a gorgeous and tasty recipe. Adding seafood takes these to a whole new level Cathy. Wow, these sound incredible. 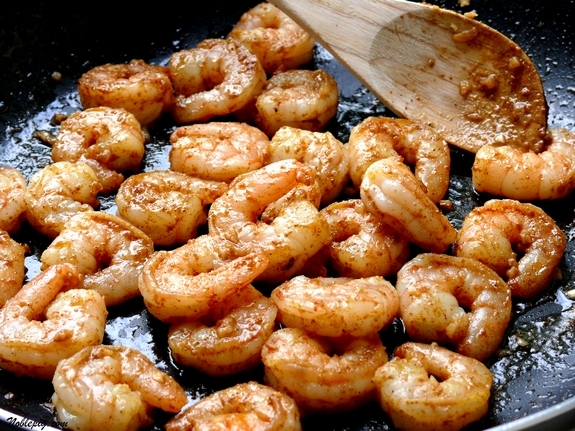 I love the way the shrimp is prepared…going to make for Memorial Day! That looks like a wonderful break from the labor of love that’s consuming you every waking hour, or so it must seem! This is right up my husband’s alley- he adores crab so much being from MD. Can’t wait to make these. Love your blog! My gosh this is sinful! What a great idea and after eating this head to the gym because I would eat all of them. They look so good! My daughter and I both agree…these are fantastic!! Two thumbs way up! I love this dish! Simple but awesome! This is right up my alley! It’s absolutely mouth-watering. I am making shrimp tacos today and this has so put me in the mood. Maybe next time, I’ll try these. Woman, you are killing me! These nachos look so amazing. what do you suggest pairing this with? 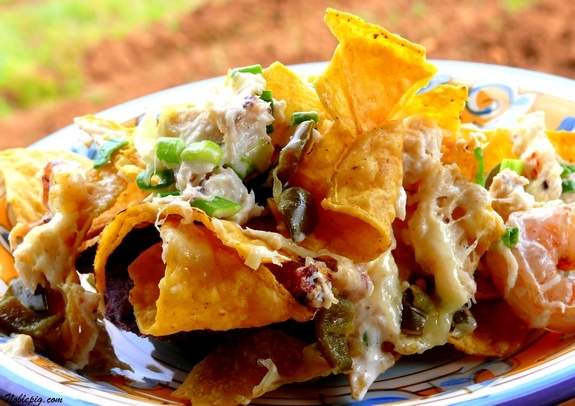 Hi, I’ve just made these terrific nachos yesterday night and they were A M A Z I N G! As I live in Europe (France) I couldn’t find all of the ingredient like the cheese that i replaced with Dutch Gouda and the green onion, that i replaced with caramelized regular onions. Anyway, that was awesome, it served about 6 ppl, but my boyfriend and I ate the whole thing. Thanks for the recipe. Those nachos look really very yummy)) Can’t wait to impress my family with this dish.